PTFE (Poly–tetra-fluoro-ethylene) is a synthetic fluoropolymer ‘accidentally’ invented by Roy Plunkett that finds numerous applications. It is well known by the DuPont band name Teflon. PTFE is a material of remarkable properties; non-stick, friction-free, self-lubricating, non-wetting, non-flammable, non-brittle, non-toxic, resistant to atmospheric conditions, resistant to fungus growth and resistant to all chemicals (except molten alkali metals and fluorine at elevated temperatures and pressures). Its electrical properties are equally outstanding. All properties are maintained over a wide working temperature range of -200oC to +350oC.Fiber-Glass too is a material of remarkable properties. Fabrics made from continuous filament yarn exhibit superior properties in terms of high tensile strength, low elongation, high temperature resistance, electric and sound insulation etc. Back in 1980 Unnati, having received technical support from DuPont, was one of the first companies in India to develop a matrix of the two materials – PTFE + Fiberglass i.e. PTFE coated Glass Cloth. Although not the first to develop we are now by far, the largest manufacturer. Various varieties are made on our towers which are the most sophisticated in the country. Should the end application demand colourful fabrics – we have them. Controlled manufacturing processes and rigid inspection procedures give the right quality of the material that is capable of resolving a wide range of problems. Conductive grades of fabrics are also our specialty where the static & charge needs to be handled carefully.Requirements to cover Antennas at high altitudes have been successfully matched with PTFE coated fiber glass fabrics used as Radomes. Special grades have been developed which allows micro-waves to pass through. They protect the Antennas from snow, dust, rain, moisture, bird nest etc. Urja has manufactured over 200 radomes with many exceeding diameters of 3 meters. 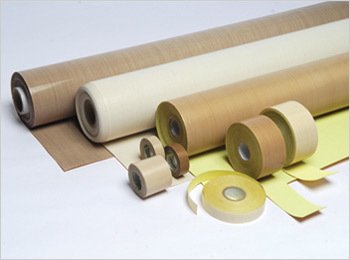 We offer a wider range of PTFE products than any other manufacturer, including PTFE coated Glass Fabric in sheets, rolls, tapes, discs, laminates, belts and threads. an ywhere in the Food industry for anti-stick applications. discs, as separators whilst curing. 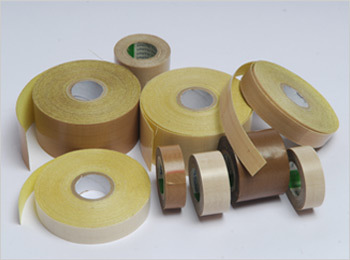 The entire packaging industry across India is aware and associated with our range of UNITO Tapes which are used for heat sealing applications. PTFE coated Glass Cloth is coated on one side with high temperature resistant pressure sensitive silicone adhesive. To ensure proper bonding between the surface of the fabric and the adhesive, the fabrics is ‘etched’ with the latest technology. PTFE COATED TAPES stick well to the heating element, allowing the heat to transfer and fuse the plastic without the plastic sticking to the heating element ensuring a permanent seal. 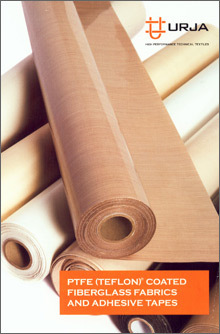 Properties of the adhesive make this fabric versatile for most end applications. This fabric withstands temperatures up to 280oC and serves as an excellent anti-stick surface where the requirements are stringent. OSA (One side Adhesive) tapes are available in various sizes.We are, in a major way, responsible for the safe delivery of your morning milk pouch / satchet.